Guaranteed to make grandparenting even more fun, Grandpa Magic is sure to entertain—and crack up—the grandkids. From the old pull-a-quarter-from-behind-a-kid’'s-ear trick and “removing your thumb” to card tricks, stunts for the dinner table, and verbal puzzles that surprise and delight, there’s something for everyone. Step-by-step illustrations make them easy to learn. Kids love magic. They love to see it, and they love to do it. Enter Joshua Jay, who started doing magic when he was 7 and was named champion at the World Magic Seminar (the Olympics of magic) by the time he was 16. His Big Magic for Little Hands is packed with 25 astonishing illusions for kids ages 7 and up. In other words, it’s sleight of hand for the small of hand. These are tricks that require little prep time and dexterity yet are guaranteed to deliver a big payoff. The large format, oversized ext, and black-and-white vintage-style illustrations make Big Magic particularly easy to follow and kid-friendly. Here’s how to levitate your sibling several feet off a bed. Escape Houdini-like from tightly bound ropes. There are also impromptu effects that can be performed anytime, anywhere, like Spook-Key, in which an antique key mysteriously rotates in your hand. Each easy-to-perform feat is clearly illustrated with step-by-step drawings and accompanied by insider tips. Joshua Jay is a master who guides his apprentices through every aspect of the magician’s art, from the first step―taking the Magician’s Oath―to how to minimize nervousness (Rule #1: Rehearse. A lot). Perfect the art of magic with simple every day objects and tips from professional magician Justin Flom. Using every day objects, daring magician Justin Flom (434K Facebook followers and 153K subscribers on YouTube) will teach kids all they need to know to perform 30 amazing and how-did-you-do-that magic tricks at the turn of a hat. Featuring step-by-step instructions and illustrations, Everyday Magic for Kids will give budding magicians all the tips they need in order to wow their friends and family, whether at home, at school, or on the go. Tricks will vary from card tricks to tricks with coins and other small objects to tricks that can be done with friends/family members. The book also includes introductory material about how to act like a magician and the basics of performing magic in front of an audience (be it a friend or a room of people). 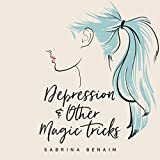 Depression & Other Magic Tricks is the debut book by Sabrina Benaim, one of the most-viewed performance poets of all time, whose poem "Explaining My Depression to My Mother" has become a cultural phenomenon with over 50,000,000 views. Depression & Other Magic Tricks explores themes of mental health, love, and family. It is a documentation of struggle and triumph, a celebration of daily life and of living. Andrea Gibson, author of Pansy, writes, "I read this book on a day I couldn't get out of bed and it made me feel like I had a friend in the world.... Simply put, this book disappears loneliness." "The Magic Book" reveals the secrets of magicians―the simple techniques that will enable anyone to perform seemingly complicated magic tricks with relative ease. Clearly written and heavily illustrated―there are over 200 illustrations in all―this book guides you through the basic principles of magic using only common household items: a deck of cards, coins, rubber bands, and even a potato. The author then provides simple step-by-step instructions for hundreds of amazing tricks which he has perfected after forty years of painful trial and error. HERE ARE SOME OF THE SECRETS YOU WILL LEARN: CONTROLLING THE ORDER OF CARDS THROUGHOUT ANY NUMBER OF SHUFFLES PUSHING A STRAW THROUGH A POTATO MAKING KNOTS EVAPORATE MAKING COINS PASS THROUGH A HANDKERCHIEF PREDICTING NUMBERS THAT ANY SPECTATOR WILL GIVE YOU ADDING ANY 5-DIGIT NUMBERS INSTANTLY FINDING ANY CARD IN A DECK, SHUFFLING THE DECK AND FINDING THE CARD AGAIN ... AND MUCH, MUCH MORE! To help new magicians develop their techniques, Harry Lorayne provides a special “afterthought” section at the end of each magic trick where he discusses possible problems that most beginners have with the trick he has just explained. In addition to the practical instruction, Lorayne provides the philosophy of magic as it has never been taught before. The clearest, easiest-to-follow book of step-by-step directions, The Amazing Book of Cards will show anyone how to do 52 amazing things with a deck of cards. Written by Joshua Jay, the award-winning close-up magician and card-obsessed author of Magic: The Complete Course, The Amazing Book of Cards combines friendly, concise text and full-color photos with a full-length DVD that teaches the lessons and shows the subtleties of performance. Here are simple, killer tricks, like "Presto Prediction," which performs the impossible task of knowing someone's choice before she even makes it. Nine different shuffles, including the Faro Shuffle, the one most often used by pros, which helps you perfectly weave a split deck together in seconds. How to perform fans, flips, and flourishes, including Ribbon Spread & Flip and Catch-a-Deck. Tricks you can't lose―go ahead, take the bet to throw a card in a hat. How to memorize a deck in less than ten seconds, how to put a deck of cards into a glass bottle, build a card castle, and more. Filling out this labor of love is a whole world of card trivia, including the origins of Kings: King of Spades is modeled after King David, the King of Diamonds is Julius Caesar, Hearts is Charlemagne, and Clubs, Alexander the Great. In this outstanding collection, an expert magician presents step-by-step, foolproof instructions. What is a self-working card trick? A trick that does not depend upon legerdemain or special abilities on the part of the magician, but a trick that works automatically because of the mathematics inherent in the card deck itself. Long practice and supernormal dexterity are not needed to perform these tricks, yet they are often among the most entertaining and most spectacular of all card tricks. Some of these sure-fire tricks are simple, a good place to begin. Others were specially adapted from professional routines and are here presented for the first time for amateurs. Almost all of these tricks can be worked informally, with a borrowed deck of cards. Some also adapt to stage presentation. Individual tricks in this book have sold for more than the price of the entire book. Amateurs can use them to get a start in magic and to feel, at once, the rewards of giving a professional performance. Advanced and professional magicians will find tricks to add to their acts or informal routines. Author Karl Fulves is one of the best-known writers and editors in the field of magic. Children love card tricks, and with this book by an expert in magic and card conjuring, youngsters will be able to master a host of tricks especially designed for them. Tricks are arranged in order of difficulty, with the simplest at the beginning of the book. Clearly written, easy-to-follow instructions and over 60 helpful diagrams take aspiring magicians through each step — from preparing and manipulating the cards to developing a line of patter (a necessary ingredient for any successful performance). Newcomers to the art of performing card tricks need no special skills — just a willingness to practice — to accomplish such astonishing stunts as finding a card under seemingly impossible conditions, causing a card to rise mysteriously from the deck, reading the spectator's mind, and 27 other mind-boggling maneuvers. From one of the world's premier practitioners of classic magic, with years of experience instructing younger readers in the magical arts, comes this new revision of his complete guide to learning and performing fantastic feats of prestidigitation. Acclaimed by the Los Angeles Times as "the text that young magicians swear by," it's full of step-by-step instructions. More than 2,000 illustrations provide the know-how behind 300 techniques, from basic card tricks to advanced levitation, along with advice on planning and staging a professional-quality magic show.